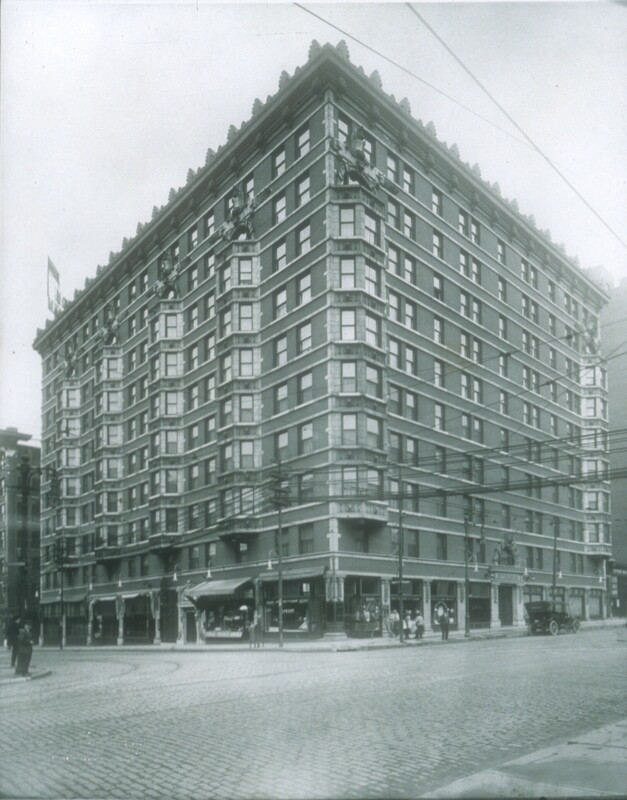 In March of 1906, incorporation papers were filed for the Marquette Hotel Investment Company; capital stock of $255,000 was fully paid. Members of the Board of Directors included Fletcher R. Harris of McNair & Harris; David D. Walker, Jr. and David R. Calhoun of Ely & Walker Dry Goods; George Warren Brown of Brown Shoe Company; and Jackson Johnson of Roberts, Johnson & Rand Shoe Company which had just acquired property on the north side of Washington Avenue between 15th and 16th Streets. The commission for the new hotel design was awarded to Barnett, Haynes & Barnett, one of St. Louis’ most prestigious architectural firms. Their residential work is found in most of the exclusive neighborhoods of St. Louis. In addition to houses and hotels (including the restored Adolphus Hotel in Dallas), the firm designed office buildings, theaters, churches (notably the Roman Catholic New Cathedral in St. Louis) and institutional structures in St. Louis and out-state Missouri. The acclaimed Place of Liberal Arts at the 1904 St. Louis World’s Fair was their work, as was #1 Wall Street in New York, and the Illinois Athletic Club in Chicago. On April 15, 1906, the St. Louis Post Dispatch forecast a record-breaking year for downtown St. Louis construction and remarked: Not the least conspicuous of the building that are to grace the St. Louis wholesale district will be that constructed for hotel purposes at the southeast corner of Eighteenth Street and Washington Avenue. Here, in place of a one-story building, work has already begun on the new 10-story hotel with 400 rooms to cost $750,000. Completed in early 1907, the Marquette Hotel was a ten-story steel frame building with 12 inch curtain walls of pressed red brick embellished with eggshell matte glazed terra cotta ornament. The hotel featured a system of eight seven-story, projecting angular bays articulating the Washington Avenue, 18th, and St. Charles Streets elevations. Entirely clad with terra cotta, the bays featured lion heads centered in each spandrel against a foil of stylized ornament. The terra cotta was manufactured by the St. Louis Terra Cotta Company whose plant was located in the Cheltenham clay products district at the western limits of the city, and offices were in the Lincoln Trust Building at 7th and Chestnut in the Central Business District.